You guys. You guys. Do you know how long it’s been since I finished a book? Thanks to the magical powers of the Internet, I can reasonably speculate. Two and a half months. I… I am literally convinced that the last time I went two and a half months without finishing a book, it was because I had never finished a book. Like, ever. Because I was still three or something. If you have any questions about my job (which, to be clear, I had only just accepted when I started reading), I think all of the meaningful answers lie in the previous paragraph, and anything else I could say is just window dressing. But anyway, yes, I have read a book. It is Swan Song, by Robert McCammon. It is one of those apocalyptic nuclear war books from the ’80s, only it shares a lot more in common with The Stand than with the Deathlands books I’ve been reading lately (and may skip ahead to, since they go so well with camping and also I am about to be camping). I of course liked the apocalypse sections, as always. The eventual post-apocalypse was saved from being too simplistically preachy by likable characters. The downside was that the majority of evil characters were too caricatured. If you tell me that a fourteen-year old boy is going to point an unloaded .357 at his dad’s head and pull the trigger several times as a joke, you can’t justify that by calling it foreshadowing. Not unless you plan to do something to make him nuanced and redeemable later. Otherwise, he was just a budding psychopath from the start, and that’s not a very interesting entrant into the armies of evil. But the good characters, yeah, pretty likable and maybe even two-dimensional in many cases. And of course there’s always that apocalypse. This entry was posted in Words and tagged fiction on May 22, 2012 by Chris. I actually saw another movie the same day I saw The Avengers (the first time), which is why I remember it even less. You know, not as good, plus just as long ago without a refresher. It’s not that Safe was bad, by any means. The truth is that Jason Statham has made an exceptionally good movie, full of non-stop action, with a likeably dark hero, a strong but nevertheless screwed person in danger, and scads of bad guys out to get them both. And he’s made this movie close to a dozen times now! In this particular case, the likeably dark hero is an alcoholic, down-trodden MMA fighter and the strong doomed person is a little girl with a photographic memory, and the scads of bad guys are Triads and the Russian Mafia and crooked cops all after a big payday that can be scrounged from what she’s seen lately. And then comes about 70 minutes of punching, kicking, shooting, and chasing. Enjoy!, if it’s the kind of thing you’re into. This entry was posted in Film and tagged action, thriller on May 19, 2012 by Chris. But let’s say you’ve done none of those things, and now you’re wondering if you want to go see a movie in which the Norse god of mischief acts as a catspaw for an invading alien army bent on conquering the earth and also stealing a head-sized white cube filled with limitless cosmic power, and then a bunch of Marvel superheroes attempt to quip aside their differences and prevent this clearly bad outcome? The answer is yes, and here’s the reason why: even though it may not be the best plot you’ve ever seen, it is very probably the most comic-booky plot you’ve ever seen, and not only is the dialogue consistently great, but practically every moment (and 100% of the moments in the third act) were among the most fun I’ve had at the movies. Put another way: would definitely watch a third time. 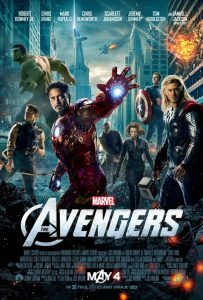 This entry was posted in Film and tagged 3D, action, Marvel, MCU, superheroes on May 19, 2012 by Chris.